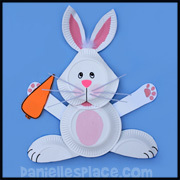 To make the bunny face, fold a regular paper plate in half. Mark off 3 1/4" from the sides of the plate at the fold as shown in the picture on the right. Mark off 3 1/4" from the sides of the plate at the fold as shown in the picture on the right. Cut the paper plate in half (the two halves will be the rabbit's ears). 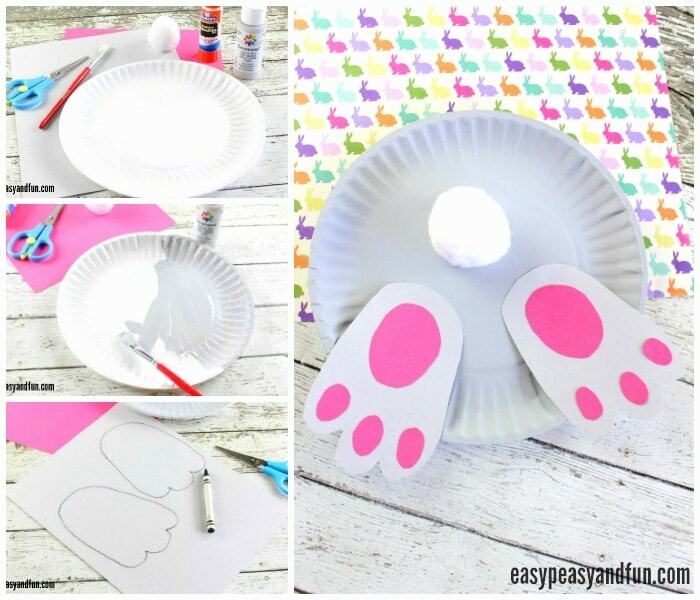 Making the rabbit's face :Using a new paper plate, cut a wedge (about 1/4 of the plate) out of the paper plate (the large part of the plate will be the rabbit's face). Now cut a small section of the ribbed edge of the plate, to use as the bunny's teeth. Get the third plate, this will be the front of the basket. Staple the ears in place, then create the bunny's face using the eyes, cotton balls as cheeks and a pink button for a nose.